The Cambrian Mountains should be a tourist hotspot. Midway between the Brecon Beacons and Snowdonia, and within striking distance of Aberystwyth, the region is blessed with spectacular, remarkably unspoilt scenery, perfect for hiking, wild camping and stargazing. Yet the region – dubbed the “Green Desert of Wales” in reference to its sparseness of population, rather than its terrain – remains firmly off the beaten track. Aled, my guide from Expeditions Wales, meets me off the train at Aberystwyth, after a picturesque three-hour ride from Birmingham New Street. We stop off at his HQ, just beyond Devil’s Bridge Falls, to pack up our camping gear, a pair of red kites circle above us while we do so. 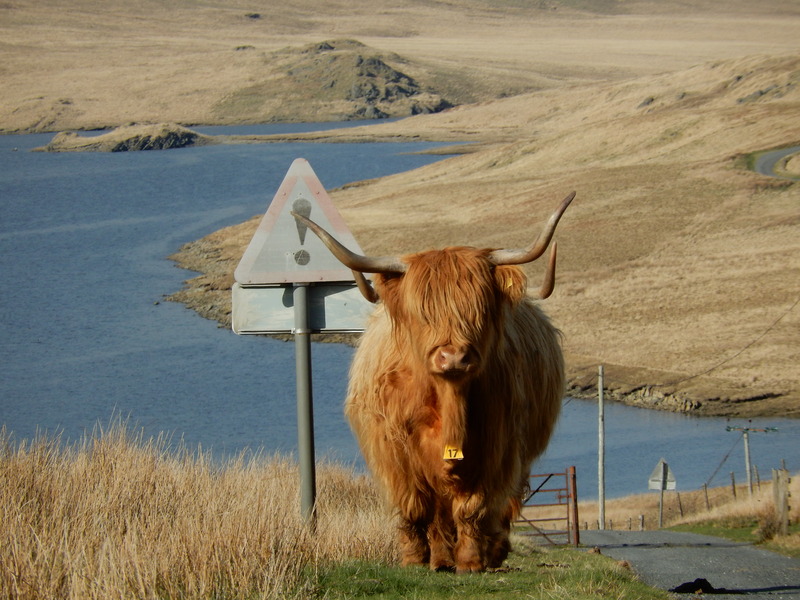 A twenty-minute drive takes us to the end of the road, where a small herd of stately Highland Longhorn cattle languidly enjoy the views over the glistening Nant y Moch reservoir. 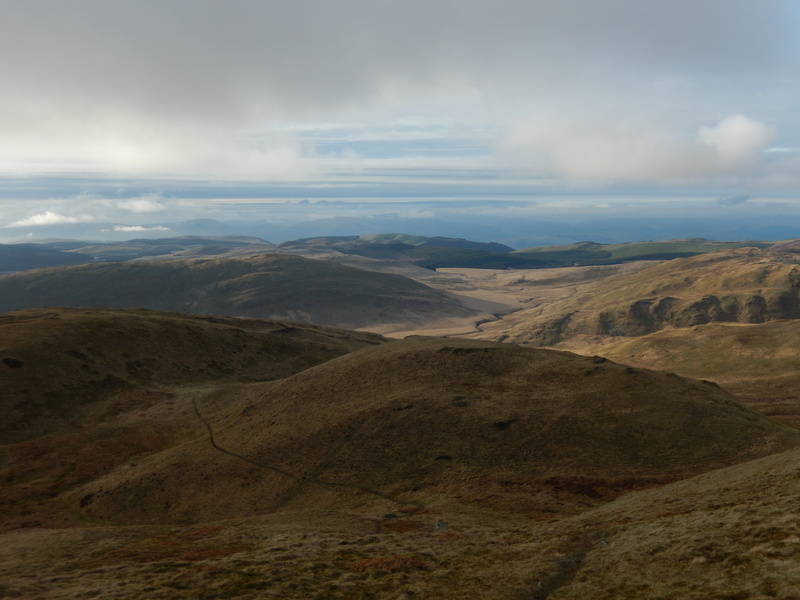 The aim for the day is to ascend the 752-metre Pen Pumlumon Fawr, the highest point in the Cambrian Mountains region. In the afternoon sun we squelch steeply uphill, passing clumps of sphagnum moss, patches of frogspawn, and large chunks of quartz that appear to have dropped from the sky. Buzzards appear overheard. It is perfectly quiet and still. On the summit we hunker down behind a cairn. Aled points south towards the Brecon Beacons, north to the peak of Cadair Idris at the southern edge of Snowdonia National Park, and across to the sources of the Wye and Severn rivers. On a really clear day, he tells me, you can see across to Ireland. Below us is an undulating landscape of gurgling streams and waterfalls, expansive lakes and reservoirs, green-tinged peaks, and lush valleys and forests. The only obvious signs of human impact – beyond the man-made reservoirs, which meld seamlessly into the natural landscape – are a field of distant wind turbines and some wonderfully isolated, and now abandoned, stone farm buildings. We see just one other person, a hardy runner. Refreshed by a well-deserved cup of coffee we hike over and up our second mountain of the day, the slightly lower Pen Pumlumon Arwystli. En route we tramp through thick, soft grass, occasionally plunging knee-deep into a hole; hiking through this landscape burns some 500-600 calories an hour, says Aled. A glorious sunset shortly arrives, accompanied by a great example of “dragon’s breath”, as a cloud of wispy mist swirls up the mountainside below us, briefly turning the peak we’re standing on into an island. The Cambrian Mountains are wonderfully unaffected by artificial light, making them ideal for stargazing: one section, the Elan Valley estate, near Rhayader, is currently applying for international dark sky status. Sadly, after setting up our tents in an idyllic valley, beside a bracingly cold stream, the clouds descend. So no stargazing for me – though I do have the perfect excuse for a return trip to one of the UK’s most beautiful landscapes. Expeditions Wales offers guided walks, wild camping, survival skills, and map-reading expeditions in the Cambrian Mountains. Shafik travelled with Arriva Trains Wales, which has regular services between Aberystwyth and Birmingham New Street. A version of this article was first published here.